This real-photo team-composite postcard, produced by "The U. S. Souvenir Post Card Co., N. Y." and featuring portrait images by noted Boston photographer Carl Horner, captures sixteen members of the 1904 National League Champion New York Giants. Manager John McGraw, in formal attire, is featured prominently in the center, surrounded by bust-length images of fifteen uniformed players, including Roger Bresnahan, Joe McGinnity, and Dummy Taylor. 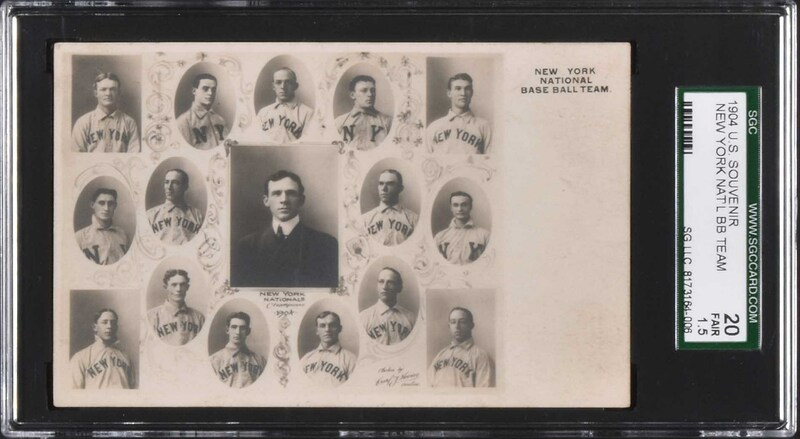 The preprinted notation “New York Nationals Champions 1904” appears below McGraw’s image. The photographer’s credit appears in the lower right corner. Traditional postcard back with credit line for The U. S. Souvenir Post Card Company. Postcards featuring individual Giants players from this series are also known. The New York Giants were champions of the National League in 1904, but despite a previous agreement between the two leagues, the Giants refused to meet the American League champion Boston Pilgrims in the World Series. 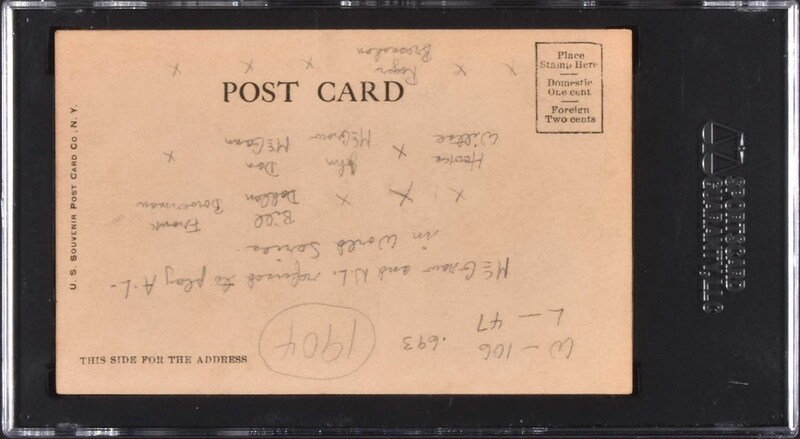 In a statement issued by Giants owner John T. Brush, and supported by John McGraw, he disparages the American League by saying the Giants “are entitled to the honor of champions of the United States without being called upon to contend with or recognize clubs from minor leagues.” The card (5.25 x 3.25 inches) has not been addressed or mailed, but a number of pencil notation appear on the reverse. Encapsulated and graded FAIR 20 by SGC. It should be noted that SGC has significantly downgraded the card for the reverse pencil notations and it is closer to Excellent in its overall appearance. This is an attractive example of this scarce souvenir commemorating the Giants' 1904 Championship season. Reserve $200. Estimate (open).